This is a sketch from few months back showing how V-track might be a part of Contraptor. At that time, I looked at the prices of V-tracks and V-groove bearings and found them fairly expensive. Nevertheless I had ordered some material to build and test the prototype, and this weekend I finally got around to it. Below are V-tracks that can attach to Contraptor angle or 1" T-slot. Fabricating wasn't too difficult but took some time. 3/16" holes were drilled in V-track at 2" intervals. 4" intervals could probably also work, but 2" fit nicely with 1ft and 2ft track lengths. One difficult thing was tapping small screw holes in the aluminum bar. I usually drill 1/8" hole and 6-32 screw self-taps into the hole with little effort. This works great in 1/8" thick aluminum. Here, the holes were about 3/8" deep and screws would stop dead after a certain point. I tried 6-32 tap in the power drill to save time and it broke on pull out after stopping too late. Basically the holes had to be tapped manually, advancing about quarter of a turn and then stepping back a couple of turns. Anyhow, this was only needed to be done once as they're not intended to be disassembled. The V-bearing element still needs to be made. I only have 2 V-groove bearings from VXB.com and I'm trying to find them for a reasonable price (not $15 a piece). 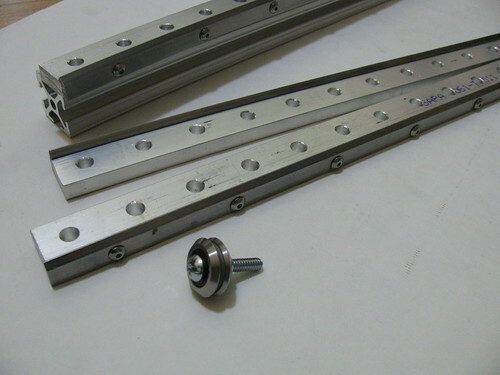 They are angular contact bearings so they can support combined loads and have very little axial play. 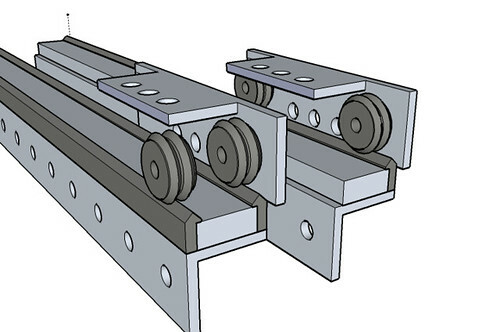 The V-track + V-groove bearings with T-slot should be able to handle loads of a larger CNC machine - 1ft x 2ft and perhaps 2ft x 4ft. Vit, where did you get the v rails? They look pretty good. Is that 1/4 straight aluminum? Do you have a source for that too? V-track is mcmaster #1582T26 - $4/ft unhardened. Hardened is about twice as much. It's the smallest size. AL bar is 3/4" x 5/16", mcmaster #1614T533 - almost $5/ft. This comes up to about $9/ft, not including fabrication, which I think is too expensive. Pre-drilled V-track is available here: http://www.qbcbearings.com/BuyRFQ/LinearB_Track_VG_P.htm# (BK#COM-T107250D), but it's pretty steep $13/ft unhardened or $17/ft hardened. Plus they have very limited quantities. AL 5/16" bar could probably be swapped for 1/4" bar ($0.75/ft at Onlinemetals), and something 1/16" thick under it, but then pre-drilled track may not work since the holes are centered in its inner wall which is 5/16" tall. Working on V-rails for contrapteur too. 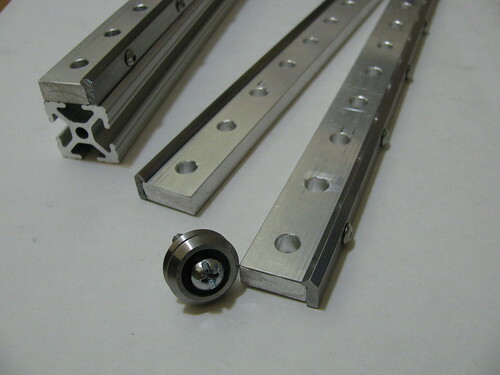 but using the aluminium angle as support ( or anything with 20mm dimensions ), and a plastic part as the rail. 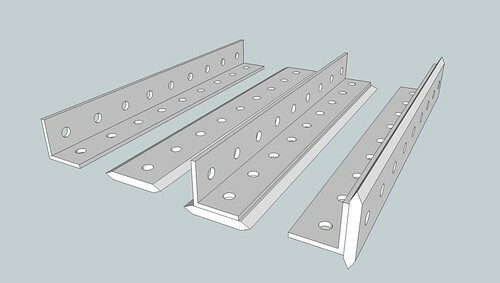 The holes and shape of the plastic rail can be lasercut directly. But for the "rail" part ( the angles at each side ), you need a special holder that will hold the parts at 45 degrees angle inside the lasercutter. About material, I'll use acrylic for the first prototypes as that's what I've under hand, but Acetal is probably better in the range of lasercuttable plastics. For price, with acrylic it should cost almost nothing, and with acetal, less than 1$/feet ( not including the aluminium angle ). More on that when the makerslide kits from the kickstarter project ship. I like that idea of the V-rail. I think acrylic should work for prototyping, Delrin/Acetal could work long term as it's fairly hard plastic. How are you planning to align the rail between 2 opposite 45 degree cuts? Aluminum extrusion like that would be flat so easier to punch (though still added cost comparing to just an extrusion like T-slot). I also backed Makerslide, looking forward to play with it… will probably need to get some metric extrusions. For cutting I'll have to design a mount, that's going to be quite a lot of work. 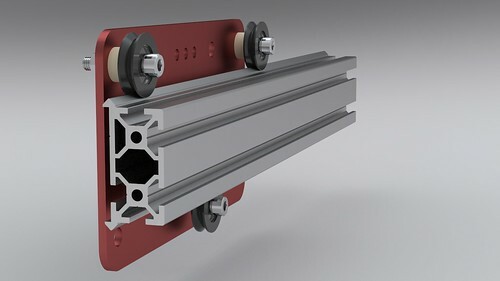 Basically, the rails will be held by the holes, so as long as the mount does not move, the rails should be cut right. 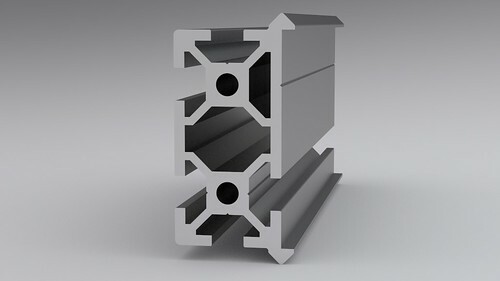 If you want metric extrusions, I can send you some contrapteur :) ( the sample I already have here is not good enough to sell, but is good enough to use ). There is some aluminum v groove rail for sale on ebay for only $2 a foot.